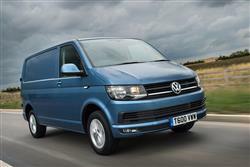 Find out everything you need to know on the new Volkswagen Transporter from independent vehicle review website Car And Driving. You can watch the video review to the left to see more of the car or read their written review below to get a true insight from an expert in the automotive industry. Volkswagen's sixth generation Transporter looks a strong package these days, with cleaner, more efficient engines and extra equipment. Plus it's as tough as ever. Jonathan Crouch reports. Practicality first. Let's start with the basics. Vehicle length varies between 4,892mm and 5292mm depending on your choice between short or long wheelbase bodystyles. As for load volume, well, that's anything between 5.8 and 9.3m3, depending on your choice between low, medium and high roof heights. And payloads? Depending on the version you choose, they vary from 749kg to a heavy duty 1,333kg. Access to all that space is via a sliding nearside door with 1020 by 1284mm dimensions that conceals a useful step. Or the usual twin rear doors that open out to either 90 or 180-degrees creating an aperture 1486mm wide and 1305mm high. There's a reasonable rear loading height of 566mm to lump stuff over into a well illuminated cargo area that offers 1244mm between the wheelboxes and 1410m of height. Then there are six floor-mounted tie-down points to keep your load from moving about, with side lashing rings being optional. On to running costs. All models benefit from Volkswagen's efficient BlueMotion Technology modifications as standard. These include low rolling resistance tyres, plus regenerative braking and Start/Stop systems, there to reduce fuel consumption meaning this Transporter is cleaner and more efficient than the outgoing model. For example, the 2.0-litre 102PS Euro6 panel van SWB can return 47.9mpg on the combined cycle and emits 153g/km of CO2. One thankful of fuel will therefore be good enough for around 850 miles, enough to get you from Portsmouth to Prague!